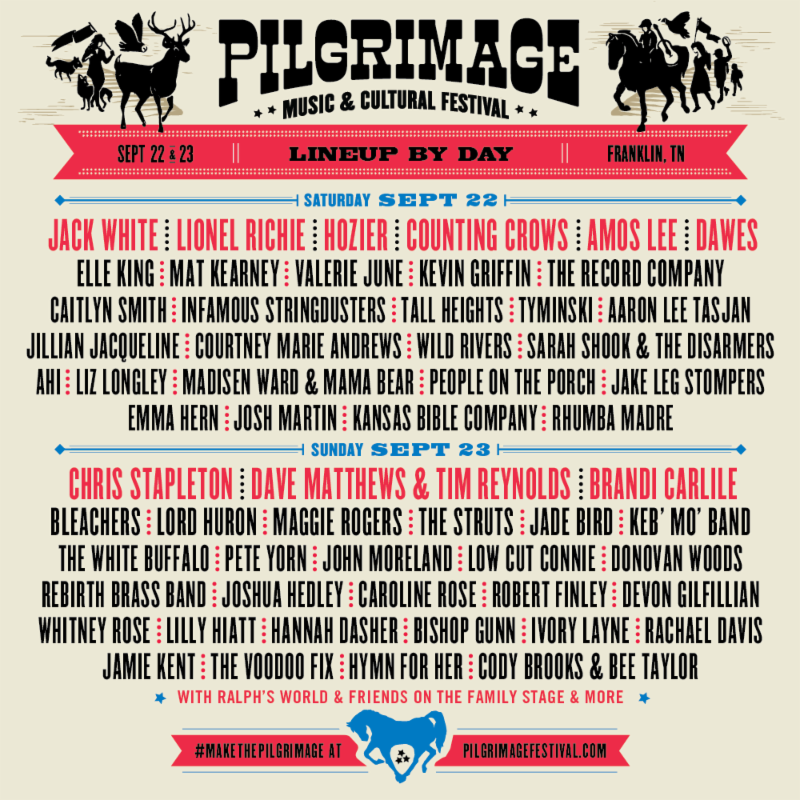 Franklin, TN – July 27, 2018 – Pilgrimage Music & Cultural Festival announces their lineup by day for the fourth annual festival taking place on September 22 and 23, 2018 in Franklin, TN. Music lovers will #MakeThePilgrimage to The Park at Harlinsdale for two unforgettable days of music, art and culture set against the natural amphitheaters with memorable performances by Jack White, Chris Stapleton, Lionel Richie, Dave Matthews & Tim Reynolds, Brandi Carlile, Counting Crows, and more. Single Day Pilgrimage Passes ($125) also go on sale today. PRESS HERE to purchase. Experience why Rolling Stone called Pilgrimage “a festival to watch” and “one of the South’s premier festivals” by The Tennessean with a 2-Day Pilgrimage pass ($185) OR 2-Day VIP Village pass ($975) as well as on-site parking passes for $60 while limited supplies last. Want to bring the kids? No problem! Pilgrimage has something for everyone and children 10 and under get in FREE when accompanied by an adult Pilgrimage Pass. To purchase your passes, please visit www.pilgrimagefestival.com/tickets. This year the festival unveiled an exclusive new experience called The Grand Champion Experience with Blackberry Farm – a heralded culinary, event and hotel venue in the Great Smoky Mountains of Tennessee. The Grand Champion pass includes all the amenities provided in the VIP Village Experience, plus even more exclusive access to live performances, with Blackberry Farm culinary & beverage delights at the Festival, and a private Friday night banquet. PRESS HERE for more info. Pilgrimage will also feature a Made South Maker Village with over 60 local and regional craft vendors and Bell’s Brewery Craft Beer Hall with televised SEC and NFL football games. You can also experience the Millville, TN Market as well as the Farm to Turntable food truck park featuring 18 local food trucks including bars and shaded center court. Between sets, celebrate the musical heritage of the Deep South with the Americana Music Triangle Experience. And everything is conveniently located to historic downtown Franklin, TN at The Park at Harlinsdale! Festival-goers can plan their trip to Franklin as well as get more information and lodging suggestions at visitfranklin.com.